« What’s Worse, Being Endorsed by a Racist or a Communist? 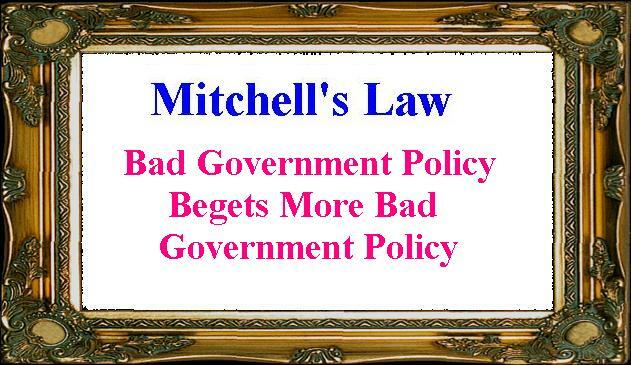 Last year, I came up with a saying that “Bad Government Policy Begets More Bad Government Policy” and labeled it “Mitchell’s Law” during a bout of narcissism. There are lots of examples of this phenomenon, such as the misguided War on Drugs being a precursor to intrusive, costly, and ineffective money laundering policies. Or how about government healthcare subsidies driving up the price of healthcare, which then leads politicians to decide that there should be even more subsidies because healthcare has become more expensive. But if you want a really stark example of Mitchell’s Law, the internal revenue code is littered with examples. The politicians created a nightmarishly complex tax system, for instance, and then decided that enforcing the wretched system required the erosion of civil liberties and constitutional freedoms. The latest example of this process involves the Foreign Account Tax Compliance Act, a piece of legislation that was imposed in 2010 because politicians assumed they could collect lots of tax revenue every single year by getting money from so-called tax havens. …the Foreign Account Tax Compliance Act, or Fatca, as it is known, is now causing alarm among businesses outside the United States that fear they will have to spend billions of dollars a year to meet the greatly increased reporting burdens, starting in 2013. American expatriates also say the new filing demands are daunting and overblown. …The law demands that virtually every financial firm outside the United States and any foreign company in which Americans are beneficial owners must register with the Internal Revenue Service, check existing accounts in search of Americans and annually declare their compliance. Noncompliance would be punished with a withholding charge of up to 30 percent on any income and capital payments the company gets from the United States. …The I.R.S., under pressure from angry and confused financial officials abroad, has extended the deadline for registration until June 30, 2013, and is struggling to provide more detailed guidance by the end of this year. But beginning in 2012, many American expatriates — already the only developed-nation citizens subject to double taxation from their home government — must furnish the I.R.S. with detailed personal information on their overseas assets. …He said his sense was that Fatca required companies “to prove your innocence.” …Then there is a question of reciprocity: Would the United States accept the same demands for information from the tax authorities in other countries — say Russia or China? It’s worth noting at this point that FATCA only exists because of bad tax law. If the United States had a simple and fair flat tax, there would be no double taxation of income that is saved and invested. As such, the IRS wouldn’t have any reason to care whether Americans had bank accounts and/or investments in places such as London, Hong Kong, and Panama. But as is so often the case with politicians, they choose not to fix bad policy and instead decide to impose one bad policy on top of another. Hence, the crowd in Washington enacting FATCA and sending the IRS on a jihad. By the way, the New York Times was late to the party. Many other news outlets already have noticed that the United States is about to suffer a big self-inflicted economic wound. Indeed, what’s remarkable about Obama’s FATCA policy is that the world is now united. But it’s not united for something big and noble, such as peace, commerce, prosperity, or human rights. Instead, it’s united in opposition to intrusive, misguided, and foolish American tax law. o From Switzerland, a story “about the backlash from United States expats and the financial sector to the Foreign Account Tax Compliance Act (FATCA)” reports that, “Growing numbers of American expatriates are renouncing their US citizenship over a controversial new tax law and ever more burdensome fiscal and reporting obligations. …banks and business people who are supposed to enforce it on behalf of the US tax man are worried about its costly administrative burden… it’s just too expensive. The consequence will be that they cut out US clients and stop investing in the US. …Three or four years ago no one talked about renouncing nationality – now it’s an open discussion. That’s a major shift in mentality. These press excerpts help demonstrate the costs of FATCA, but what about the benefits? After all, maybe the law will lead to lots of good results that offset the high regulatory costs and lost investment for the American economy. Well, the only “benefit” anybody had identified is that FATCA will transfer more money from the productive sector of the economy to the government. Indeed, Obama argued during the 2008 campaign that cracking down on “tax havens” with proposals such as FATCA would give politicians lots of additional money to spend. But when the legislation was approved in 2010, the Joint Committee on Taxation estimated that the new law would raise only $8.7 billion over 10 years, not the $100 billion that Obama claimed could be collected every single year. This video has some of the damning details. One final point demands attention. While it appears that the rest of the world is against FATCA, that’s not completely true. Some international bureaucrats in Paris, funded by American tax dollars, actually want the rest of the world to adopt the same Orwellian system. Here’s a blurb from the New York Times story. In other words, the pinhead bureaucrats at the OECD think FATCA’s such a swell idea that they want to create a global network of tax police. So not only would America erode the sovereignty of other nations because of our bad tax law, but those other nations would be able to impose their bad tax law on income earned in America! And just in case you think that’s just irresponsible demagoguery, it’s already beginning to happen. Check out this IRS regulation, proposed by the Obama Administration, that would require American banks to put foreign law above American law. Well, the rest of the world seems to loving printing a bunch of Monopoly money. Japan has QUADRILLIONS of yen in debt and it’s being rewarded with the lowest 10-yr rates this century. Bad policy does indeed beget more bad policy. Of course, the US government has no intention of helping other governments track down their citizens with FATCA reciprocity. The whole thing is nothing more than a charade. America’s Founders are probably rolling in their graves about the ignorant hypocrisy of the US Government. America would not exist if great men such as Thomas Jefferson, Benjamin Franklin, Patrick Henry, Thomas Paine, John Hancock, Paul Revere, John and Sam Adams etc. bowed to British Tyranny and forked over taxes to London with NO REPRESENTATION in British Parliament. The politicians in the city bearing George Washington’s name are a disgrace taxing Americans abroad who have NO REPRESENTATION in US Congress. They need to go back to primary school and learn about the main cause of American Revolution — taxing EXPATS without their consent. FATCA and all the other repressive legislation coming out of Congress affecting EXPATS will result in one thing — a tidal wave of Renunciations of US Citizenship. It will be ignored at first, but before long, will become a major source of embarrassment. This law, more than anything else (except, perhaps, ObamaCare, and the TSA, and…) makes me sick to my stomach. Although there’s still a years long recession on (didn’t they used to call that a “depression”); everything in America seems almost undisturbed …. on the surface. It is this law, and others like it, that really expose the darker INTENT of our Washington “elite”. “Want to be able to come back and, say, take care of your elderly parents when the need finally arises? Then pay tax to a country (USA) you currently have very little to do with. If you don’t, we not only punish you by treating you as an illegal alien, were you to return, but will also punish the rest of your family and relatives by severing your ties with them – i.e. leave renunciation of citizenship as your only option“. This is the type of dialog spoken in old war movies by actors with German accents, wearing swastikas on their uniforms. Barriers to immigration are one thing that can be debated. But barriers to EMIGRATION are characteristics of truly oppressive regimes, most of which no longer exist. In a gross aberration of what America represents (once represented?) this stands out even internationally as oppressive statism to a level unmatched by other nations worldwide. But the American Voter has to indirectly approve all this, and apparently, approve he does. Just go into the streets and ask ordinary Americans: “Should the IRS enforce draconian laws in an effort to collect more revenue for you, from a minority living outside the United States?” and see what answer you get. It is yet another example of the American Voter psyche reverting to the worldwide norm of central planning and pitchfork economics. Convergence to average worldwide prosperity will inevitably follow. Americans are in denial, trying to forestall the disaster of decline by… jamming the safety valves! The declining years of the American Empire will be ugly. What was sold as HopNChange will turn out to be a slow march towards statist oppression and relatively swift economic decline. You need to add as an example of Mitchell’s law the ongoing higher education bubble. As government subsidies for student loans increases, the salaries of staff increase, causing tuition costs to increase, causing more government subsidies for student loans. Maybe it’s a super-secret and brilliant Vast Right Wing Conspiracy to reduce government deficits by making sure there’s no buyers for government debt because it’s too big a pain in the back-side to do it? on December 30, 2011 at 11:37 am Dana H.
In kind of the same way that a national sales tax would. on December 30, 2011 at 11:12 am Obama unites world against the U.S. « Renounce U.S. Citizenship – Be Free! Thanks for a superb article on this issue. I would be very surprised if the U.S. is able to impose FATCA on the rest of the world. There may be some short term compliance (or attempts at it), but FATCA will encourage foreign financial institutions to find ways to avoid the U.S. markets. This is the exact opposite of what the U.S. needs – which is lots of foreign investment. FATCA is also a way of imposing capital controls on money inside the U.S. Furthermore, it imposes requirements on U.S. citizens living outside the U.S. that will make renunciation of U.S. citizenship a growth industry. One of the problems is that the U.S. uses citizenship-based taxation. The IRS has created an expensive regulatory apparatus to collect an almost insignificant amount of tax from U.S.citizens living overseas. It is a ridiculous waste of public funds. The time has come for the U.S. to join the world and repeal citizenship-based taxation. Actually, don’t you think they were trying to conjure the image of a “FATCAT Bankers”? Repeal of FATCA by a Republican Congress and President in early 2013 would practically guarantee a bump in the markets to start of Romney’s administration. Talk about low-hanging fruit. Just sayin’. on December 30, 2011 at 9:00 am Adrian Scott, Ph.D.